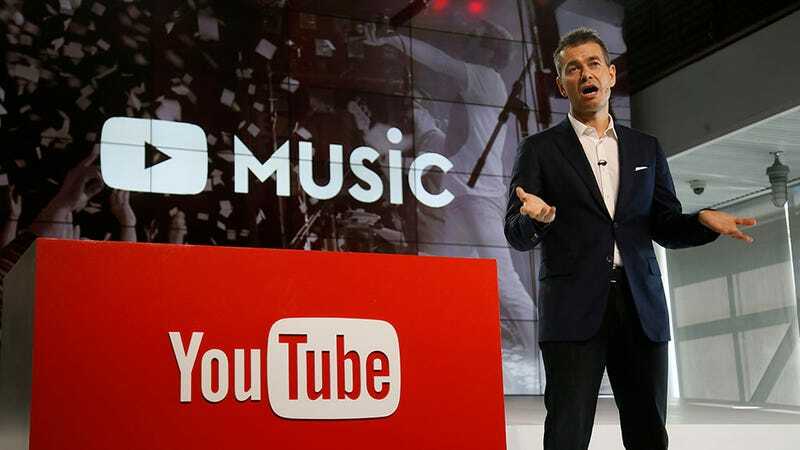 Earlier this week YouTube’s Chief Business Officer Robert Kyncl penned a sunny blog post applauding his platform’s payouts to musicians—$1 billion derived from advertising in the past twelve months alone. That’s an objectively large sum. It’s also a devastatingly low figure compared to pretty much every other online music service. “YouTube, the world’s largest on-demand music service, is not paying artists and producers anything like a fair rate for music,” the International Federation of the Phonographic Industry, a trade group, contended in a response yesterday. According to the IFPI, every Spotify user equates to about $18 the company kicks back to the music industry each year. For YouTube that figure dips to a measly $1. These are bold claims, and the actual chasm between YouTube’s ad-supported payouts and Spotify’s may be even wider. Spotify’s paid out $2 billion last year while YouTube only crossed the $1 billion threshold this year. A YouTube spokesperson would not quantify what platform payouts to the music industry were in years prior, but they confirmed this year was its highest to date. While horseboob admits that “Distrokid analytics are not that great,” as a case study it reveals that for indy musicians, Spotify and YouTube are the biggest money-makers by far, and the contrast between the two is staggering. Some discrepancy in payouts between platforms is to be expected. But the value of a stream differing by a full order of magnitude looks a whole lot like a broken business model. “An ad supported business is not measured on a per stream basis, but on the total revenue paid out each year,” a YouTube spokesperson told Gizmodo in an email but did not disclose what metrics are used to determine artist payouts. (Perhaps, this is why the IFPI referred to that $1 billion as “unexplained numbers.”) The spokesperson continued: “Comparisons to other audio-only, subscription music services are apples to oranges.” Spotify, it should be noted, offers a free, ad-supported model for non-subscribers. Horseboob also contended in their post that “a lot of the music on YouTube is not on the artist’s channels, in which case they are getting nothing,” an issue which has loomed large over the platform for years. Quite often music is uploaded to the platform by fans, and can result in lost ad revenue for the copyright holder. As the New York Times reported today, this exact issue is likely to result in a settlement of $40 million to the National Music Publishers’ Association. While YouTube smirkingly pushes the narrative that, as Kyncl puts it, “multiple experiences and models are succeeding alongside each other,” data makes it more likely YouTube is the one succeeding. Musicians, on the other hand, are still getting screwed.